APRES TOUT is an extremely inviting deluxe barge personally operated by owners Rory and Caroline Macrae. 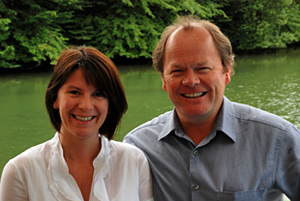 After working in the luxury hotel barge cruise industry in France for over 20 years, they bought Apres Tout in 2011. With many years of making guests happy on other barges, they are proud to be customizing their own barge cruises for passengers after all these years – hence the name Apres Tout, which means in French "after all." With their vast knowledge and engaging personalities, it is no wonder Apres Tout has become one of the most popular barges on the canals. Those who enjoy an elegant yet casual atmosphere with the opportunity to join Captain Rory in the wheelhouse or Cordon Bleu Chef Caroline in the kitchen will feel a sense of belonging as if they are family. 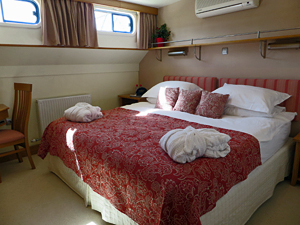 Quality exudes in every aspect of this extraordinary barging experience from the relaxing suites with king sized or twin beds to the huge partially covered sundeck with table and chairs for dining, lounge chairs for relaxing and hot tub for enjoying a glass of wine under the open sky. 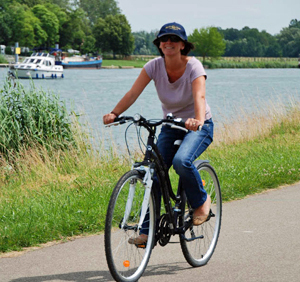 Bike and/or walk the towpaths along the canal in the beautiful Ouche Valley. Meeting Location: Your hotel in Paris. Transportation by van included. All barge amenities including bicycles, hot tub on deck, music system, library, etc. Depart Paris in our luxury private transfer service direct to the barge moored in St Jean de Losne, where you board the Apres Tout for your cruise through Burgundy on the Canal du Bourgogne. A champagne reception gives you a chance to meet the crew. Once you have settled into your cabin, it will be time to return to the deck for a cocktail cruise on the river Saône. A delicious four course dinner will be served with wonderful wines to match, followed by after dinner drinks – weather permitting all served on the magnificent teak deck. Leaving the River Saône behind, we now enter onto the Canal de Bourgogne through the first of many locks! Spend the morning enjoying your first cruising day on the flat plain from the river toward Dijon. After lunch, your guide takes you to the area of the ‘Côte d’Or’ ( In French meaning Gold Coast) planted with vines that produce some of the world’s most famous wines. Here we visit the “Clos de Vougeot”, a medieval château surrounded by vineyards. This is truly a magnificent Chateau and the headquarters of the Chevaliers du Tastevin, whose special label is awarded annually to the finest Côte d’Or vintages. We have arranged some fantastic World War II jeeps to take you through the vines to explore some of the small tracks that wind through this famous land for some exhilarating fun! For those who have a little more energy, we can stop at a truffle producer and learn how the black diamonds grow and then how to find them. We return to the Apres Tout for a well deserved refreshing cocktail. This morning we visit Dijon, a wonderful town with a long and interesting history. As it is market day, the centre is thriving with traders selling their produce and shoppers meandering taking in the atmospheric feel of this magnificent city. There is plenty of time to shop in the city’s many chic boutiques or sit in a pavement café and watch the world go by. Later, we will visit the Grey Poupon mustard shop for a tasting of this famous product and then take a walk through the historic area of the town which will captivate you with its historical past, including the Ducal Palace. We return to the barge for lunch and an afternoon cruise into Dijon, where we moor for the evening. Tonight, try a ‘Kir Royale’, made with local Cassis (a liqueur invented here in Dijon and made from blackcurrants) and mixed with the Burgundy Champagne equivalent named Cremant. Leaving Dijon behind we head to the valley of the Ouche. Enjoy a relaxing morning on board; there are many locks for dis-embarking to cycle or to walk. Late morning you transfer over the hillside and down through the vines to the charming village of Gevrey Chambertin. 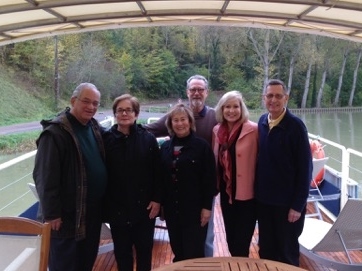 We are greeted by the owner of this prestigious Grand Crus wine makers, and here we have a splendid lunch on their terrace over looking their vines! During lunch Madame Drouhin Laroze (the owner) will present her wines. This is truly a very unique experience. After lunch, we are given a very informative private tour of the cellars. We then take a scenic drive along the famous ‘Route du Grand Crus’, Passing through many of the famous wine villages. The morning is spent cruising through the lovely Ouche Valley, this is a truly spectacular part of the canal, small villages pass by, cows wander in the fields, and there is nature all around. There is a total feel of peace and tranquillity as we slowly cruise this magnificent canal. After another wonderful lunch, you are transferred to the delightful town of Beaune, the capital of the wine region of Burgundy. Enjoy a visit to the famous Hôtel-Dieu, Hospice de Beaune with its interesting history and magnificent tiled roof. After some free time for shopping or strolling in the pedestrian streets we have an optional appointment for a private wine tasting at the famous cellars of Joseph Drouhin, this tour is by invitation only. Later, we return to the barge for a refreshing cocktail and freshen up before one of the high lights of the week, a gourmet dinner at the stunning Abbaye de la Bussiere. This Relais & Chateaux property has been beautifully transformed from a Cistercian abbey into a fabulous hotel, set in architectural grounds where you will dine in style tonight. Today enjoy the final stretch of this beautiful canal cruise. We pass through several more locks until reaching our destination of the port at Pont D’Ouche. This afternoon we make a special private visit to an English artist of world renown, who has set up his gallery and workshop in a converted barn. His work is world class, and has been recently commissioned to create a piece of art to celebrate the Olympics in London. We are shown through the workshop, and explained how he makes his marvelous pieces of bronze sculptures many of which have been produced for the Queen of England, including the war memorial in London. We then drive up to Châteauneuf-en-Auxois, a medieval hill-top village steeped in History. 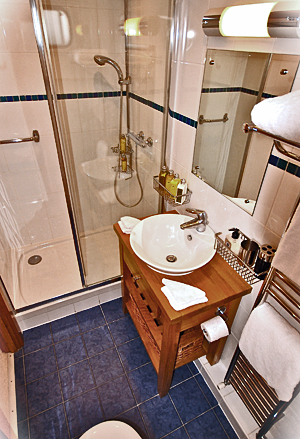 This is a charming place with stunning views from all angles, of the surrounding countryside. Return to the Apres Tout for a gala dinner with wonderful wines to match and a fond farewell. On alternate weeks the cruise will be in the reverse direction. Th​​is ​is a sample itinerary and ​is subject to change. You will be transferred from Paris by TVG train and met at the Lyon station. From there you will be transferred to the barge. A champagne reception gives you a chance to meet the crew. A delicious four course dinner will be served with wonderful wines to match, followed by after dinner drinks – weather permitting all served on the magnificent teak deck. An evening cruise through the heart of Lyon will be your introduction to this magnificent city. market hall devoted entirely to antiques. This afternoon we cruise upstream to Montmerle on the edge of the Beaujolais region. Dinner aboard. Your day will begin with breakfast and a cruise through the lower Saône valley to our mooring in the heart of the town of Mâcon. This afternoon’s visit is to the beautiful countryside around Macon, celebrated by the Romantic poet Lamartine, as well as a visit to a local winery producing the world famous Pouilly Fuissé wines. This morning you will visit the thriving town of Bourg en Bresse where you w​e browse through a wonderful traditional street market. This area is famous for the Bresse chickens, which will be featured on tonight’s menu! After lunch aboard and a relaxing cruise through the bucolic countryside of southern Burgundy, we will arrive in the riverside town of Tournus, where you will be shown the historic streets and the town’s most famous monument, the 11th century Abbey of St Philibert. Dinner aboard. After a relaxing morning cruise up the River Saône, guests will depart the barge for the historic town of Beaune. First we start with a wonderful lunch in this beautiful town and then explore the famous Hospice du Beaune. There will be free time for shopping before we enter into the amazing cellars of Joseph Drouhin for a private tour and, of course, a wine tasting. There will also be time to explore the city of Chalon with its shops and famed photographic museum. Dinner aboard. This morning you will be able to take the wheel of an authentic World War ​II jeep and discover the beauty of the villages and vineyards of the famed Côte Chalonnaise. Then back to the Apres Tout for another delightful lunch and a leisurely cruise to Saint Jean de Losne. After breakfast, disembark the barge for the transfer by luxury minivan to your hotel in Paris. "Beth, it was "the" most fabulous week! The other 4 people and we got along so well. Accommodations were even better than we had hoped and the food, cheese, wine selections and our side trips were prepared so special just for us! Thank you so much for helping us to do this. Captain Rory, his wife Caroline, Nicole our cheese expert, and Julian our sommelier and tour guide extraordinaire were the best!!" "What a great barge! It is our favorite of the three barges we have cruised on, and we would certainly consider another cruise on Apres Tout someday. Rory and Caroline have done a fine job restoring, decorating and maintaining the barge and they are terrific hosts (and we were thrilled to have all of our pillows!). Caroline's meals were consistently very good, and well balanced so they stopped just short of being too much. I felt that the wines (and cheeses) were perfectly selected. 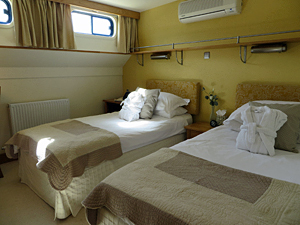 . . To anyone considering barging, we would recommend Apres Tout as the best without qualification." "Bill and I really loved this barge trip! It surpassed our expectations in every way. Caroline, Rory, Hannah and Nick made us feel at home, only better. Caroline's meals were a reason in itself to return to the Apres Tout !" "We are home and going through withdrawal! We had a fabulous time in Burgundy...Rory, Caroline and crew were great hosts; they are truly a team catering to your every need. The Apres Tout is a beautiful, well loved boat mastered by Captain Rory. We can't say enough about Chef Caroline's exceptional meals; Nick's knowledge of wine, Burgundy, and France as a whole, and the great care we received from Hannah. It was indeed a luxury cruise that exceeded our expectations. A special "thanks" to Beth for holding our hands through the process!"